Sensational silvers and killer kings. Trophy-worthy trout and fantastically finned grayling. It's a lineup of Alaska fishing dreams and these spectacular species — and many more — are all within casting distance when you're in Anchorage. Yes, Alaska's largest, busiest and most populated urban hub is also a fishing fantasy come to life. And that isn't a fishing tale. 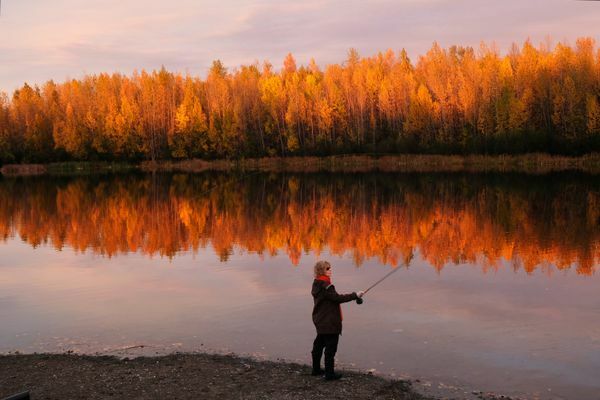 Even the most secretive fisherman will brag about this fishery, and it couldn't be kept secret anyway — Anchorage is a mainstay on any "America's Best Fishing Cities" list. "You can go fishing just about anywhere in Anchorage," explained Dan Bosch, Alaska Department of Fish and Game's Regional Management Coordinator for the Anchorage area, among other Alaska regions. "It's some of the best fishing around. And the accessibility — it's so easy. Right at your doorstep." For Alaska visitors, that includes hotel doorsteps. The community is covered in streams, creeks and lakes that are packed and stocked with tens of thousands of fun, fighting fish. 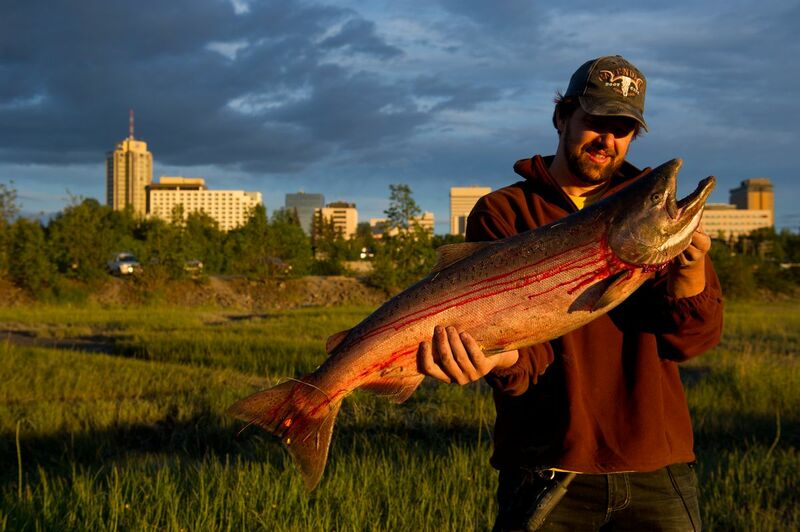 And one of Anchorage's most exciting fishing holes is set in the city's most popular hospitality hot spots — downtown. Ship Creek carves from northeast to west Anchorage, passing by the William Jack Hernandez Hatchery before depositing downtown into picturesque Cook Inlet. It's a beautiful natural oasis on the edge of the Anchorage's cityscape. Its water is home to a constant run of summer salmon — kings early in the season, silvers (coho) later — and its banks are usually bustling with fishermen. "Right downtown you can fish for king salmon and coho salmon," said Bosch, himself a Ship Creek regular who has worked and fished the Anchorage area for decades. "If you haven't fished there before, just watch what everyone is doing, if they're using eggs or spinners, and where they are setting up along the creek." Ship Creek might be the most visible venue, but incredible fishing opportunities abound in every corner of town. Local lakes (Campbell, DeLong, Jewel, Mirror, Sand) are loaded and creeks (Bird, Campbell and Ship) and rivers (Eagle and Eklutna) are crammed with an array of fish: from several freshwater and landlocked salmon species to Dolly Varden/Arctic char and awesome Arctic grayling. Chester Creek runs through the center of town and can be great for rainbow trout (8-12 inches! ), too. Sport fishing is a year-round activity in Anchorage, but the action surges in summer. From May to September, the fish counts are high, the sun is warm and bright into late and early hours, and fishermen are giddy. Where should you wet a line? Around Anchorage, practically anywhere there's water there are fish. And even though you're casting and catching in Anchorage, many of these fishing holes also offer peace, quiet and the natural vibe of wild Alaska. As you cast and relax, it's easy to forget you're in Alaska's biggest city. Anchorage is also the jumping-off point for fine fishing adventures all over Southcentral Alaska. A short drive or quick hike in any direction from the urban area adds even more options. For world-class ground fish and salmon fishing, just drive south for an hour (Prince William Sound out of Whittier) or two (Resurrection Bay out of Seward) or three (Kachemak Bay out of Homer). Some of the world's most exciting salmon fishing also goes down on the Kenai Peninsula, a few hours south of Anchorage where the Kenai, Russian, Anchor and Kasilof rivers flow flush with fish. And for a once-in-a-lifetime fishing trip, hop on a float plane for an excellent daylong or multiday guided excursion and wilderness lodge stay. If you want a chartered or guided fishing experience, shop around. Most reputable charter companies have years of experience and are easy to study up on via their websites and social media. Find a perfect fish fit by being specific about what you want to catch and how much you want to spend. One charter fishing bonus: it often comes with free sightseeing in some of Alaska's most incredible landscapes. Then again, with all the great fishing within the Municipality of Anchorage, why would you leave? Overwhelmed by all the options? Too excited to think clearly? Contact Fish and Game in person, on the ADF&G Sport Fish Information Center phone line (907-267-2218) or online (adfg.license@alaska.gov) for questions about fishing, licenses, regulations or anything else Anchorage or Alaska fishing related. This Fish Information Center provides up-to-date information on all the fisheries. You can even borrow fishing gear from its Raspberry Road location! There are also area fishing blogs and message boards, friendly fishermen and retailers who are happy share tips while you shop for tackle or gear. Lures and lines, rods and reels — the choices are endless. But there's one piece of equipment fishermen (residents 18 or older and nonresidents age 16 or older) must carry: a sport fishing license. Nonresidents have many fishing license options, from 1-day ($25) to 14-day ($105) to annual ($145). If you are on a quest for a king, you will also need a king salmon tag, which runs an additional $15 for one day and up to $100 for an annual stamp. For residents, there are numerous license options for different fishermen (military, low income, senior citizens) so do your research. You can purchase Alaska sport fishing licenses at most sporting goods shops, even many grocery and convenience stores, and online. It's also a fisherman's responsibility to know regulations. Bosch said the key to figuring it out is to read the general regulations for each area (example: the Anchorage area), then look for site specific regulation for streams (example: Ship Creek). In other words, know where you are fishing and what stream you are fishing on. Oh, and always be bear aware — clean your fish and fish waste responsibly. This might be a big city, but it's still Alaska.